March came in like a lamb and hit like the proverbial lion.. We had several days of very strong winds. Which meant tucking in leeward shores. How ever the last several days, the weather and the fishing has been outstanding. water temperatures have been near 80 degrees. This makes the fish and me very happy. 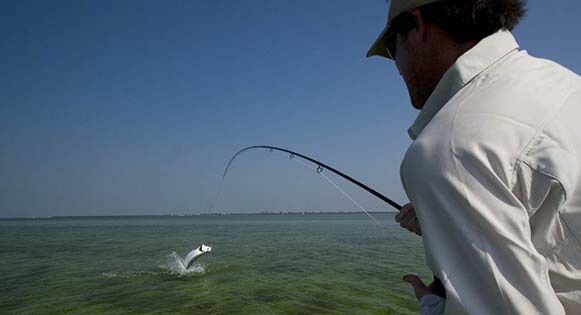 Large migratory tarpon have appeared in the basins and on the flats near deeper channels. These fish have been in the mood to eat! Jane with her first bonefish! Been some happy bonefish on the flats too..
Randy sent me this pic of a permit release.. He got this fish from his kayak! Been a fair amount of permit on the gulf edge.. Better get um now, in another 3 weeks or so they will become scarce.. Mid April is when they start to move off shore to spawn..
Cori releasing his first tarpon! I still have some openings for tarpon season.. also several cancellations.. If you need more days, I can "Hook You Up" with one of my buddies!